Constructed: in the 6th or 5th century B.C. 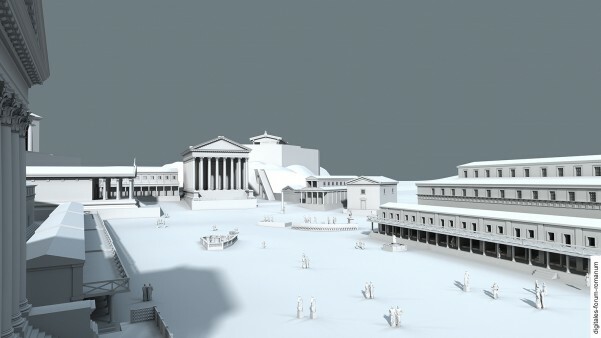 Even though the tabernae might seem highly unremarkable in comparison to the monumental temples and basilicas of the Republican Forum, it is exactly structures such as the tabernae that provide us with crucial insights into a highly important turning point within the Forum’s history: Its transition from market place of a city-state to a square intended to represent the global power of Rome. The early Forum of the 6th and 5th century B.C. was characterised by two central areas located in opposing corners of the square: On the one hand, the political centre around the Comitium and the Curia in the north-west corner and on the other hand, the religious centre around the Regia and the Temple of Vesta in the south-east corner. The area between these two served as a market place – here one has to imagine a lively and colourful, at the same time loud and dirty, crowd of people bustling about. In order to organise and (certainly also) regulate these commercial activities, shops (lat. tabernae) were erected along the sides of the square. In these shops there must have been all kinds of merchants selling everyday commodities – the literary sources report that butchers sold their meat there, for example. 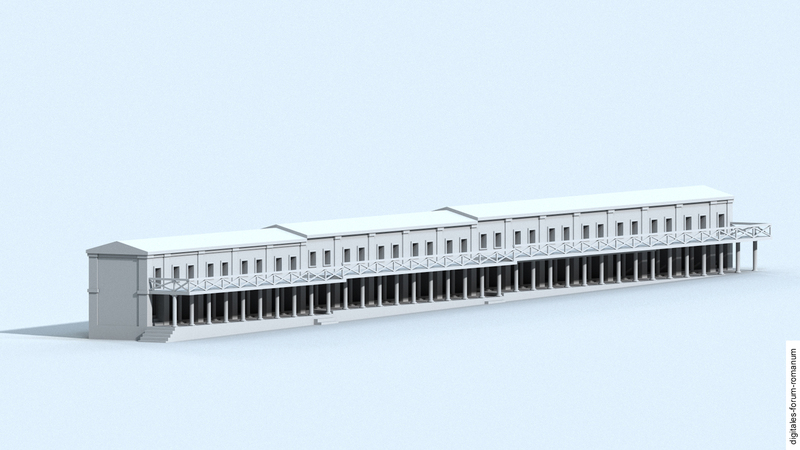 Ancient writers date the erection of the first tabernae back to king Tarquinius Priscus in the early 6th century B.C., who apparently had porticoes and tabernae built on the Forum. It is no coincidence that the construction of the Cloaca Maxima is sometimes attributed to him, a comprehensive project whose goal was to organise and structure the Forum in a more efficient way, thereby increasing its usability. The erection of the tabernae was an important step with consequences more far-reaching than first meet the eye: The fact that the shops were located in a public area and therefore leased from the state resulted in commerce being brought under state control, instead of in the hands of the simple stands on the Forum or each individual private house on the Forum with their adjoining shops. According to the literary sources, tabernae already existed in several spots on the Forum by the 5th century B.C. at the latest. This leads to the assumption that in the 5th and 4th centuries B.C. 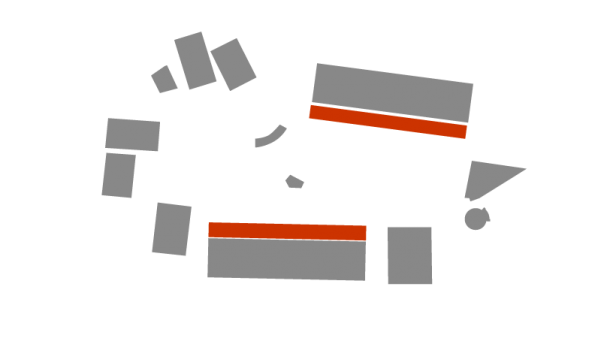 all free areas at the Forum’s borders were successively occupied with shops. This can be safely assumed for the north and south side; it is also likely for the west and east side. In the late 4th century B.C. 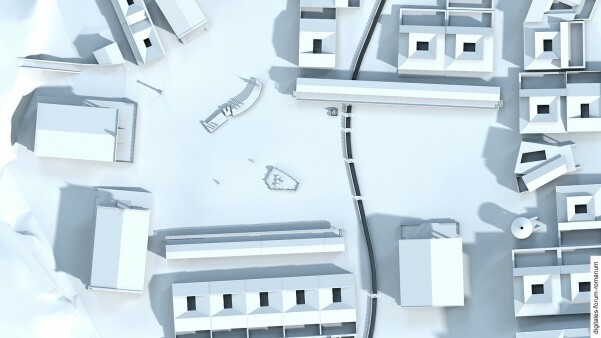 the appearance and function of the tabernae were heavily altered with far-reaching consequences not only for the shops, but for the entire Forum. The censor C. Maenius initiated this process in 318 B.C. (he was the same person who displayed the naval rams at the Republican Rostra after his victory in 338 B.C. 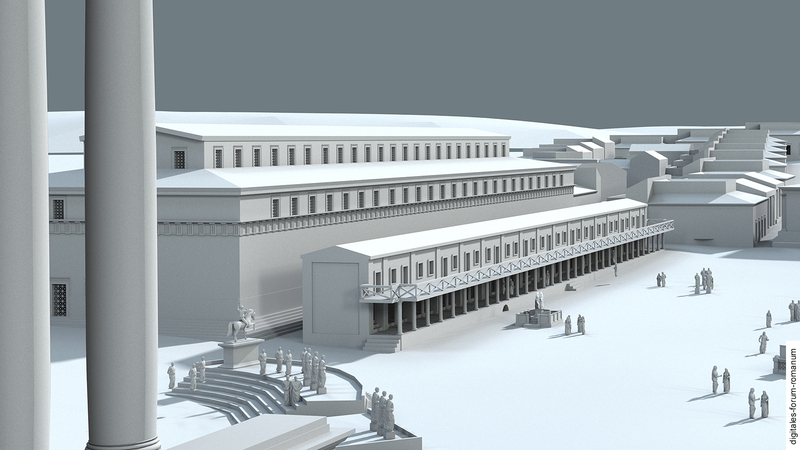 ): The structure of the tabernae was modified; a platform (or simple balcony) was added to the upper storey of the shops, from which it was possible to observe games or processions on the Forum (of course these exclusive “seats” had to be paid for). These balconies on the tabernae seem to have been such a success so that they were named “Maeniana” after their inventor shortly afterwards. From that time on, they constituted a standard feature of tabernae on Republican fora. In the context of this structural modification, which defined the Forum primarily as a space for political representation, the ordinary merchants were driven out of the tabernae (from that period on commercial activities were relocated to the adjacent Macellum, a designated market area north of the Forum). The money-changers (lat. argentarius: silversmith, money changer) replaced the butchers and other ordinary merchants in the shops on the Forum and reshaped the mercantile profile of the Forum. From then on the Tabernae were called “tabernae argentariae”. This departure of the ordinary grocers and arrival of the money changers has to be seen as part of a bigger development which changed the Forum (and Rome) profoundly: Until then, the Forum had been used as a normal marketplace within an agrarian city-state with the purpose of supplying its citizens with everyday commodities. However, now Rome had become a territorial power that had to deal with rulers from other cities and regions as well as with their legates. Thus, the Forum changed more and more into a space for the representation of the rising power Rome. The Forum was used to receive foreign dignitaries, organise the contact and economic cooperation with foreign nations and prepare the financing of an increasing number of military campaigns. In consequence, the activities of the money changers became more and more important to Rome’s foreign policy – explaining why they were allowed to occupy the former shops. 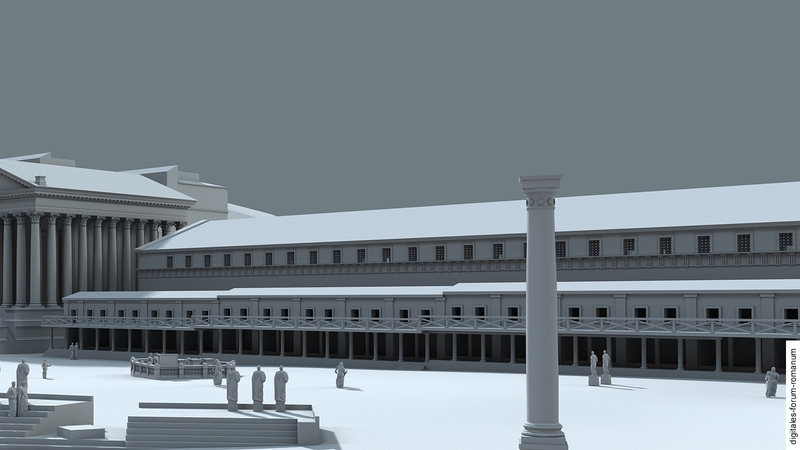 These re-purposed tabernae gave the Forum a new and prestigious, simultaneously more sophisticated appearance: It is in this context that the remark of the scholar Varro should be understood, who commented that the arrival of the argentarii boosted the Forum’s dignity. As a symbol of the Forum’s increased dignity, the tabernae argentarii persisted through the subsequent centuries of the Republican period and influenced, with their comparably simple architecture, the appearance of the Forum along the long sides. In 310 B.C. they were decorated with the gold-plated shields of the defeated Samnites and thereby acquired the status of a prestige-enhancing structure celebrating the triumph of the general L. Papirius Cursor. 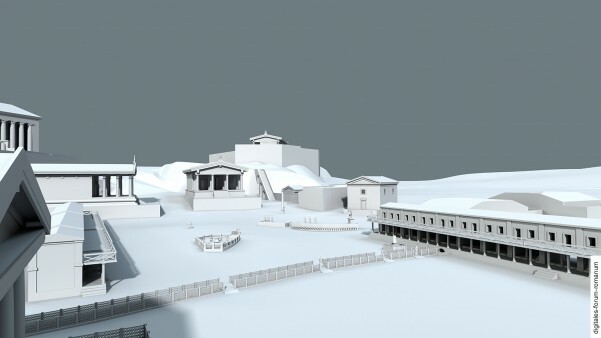 During the big fire on the Forum in 210 B.C., the tabernae on the north side were destroyed and rebuilt (thus earning them the name tabernae novae, the “new tabernae”, in order to distinguish them in name from the tabernae veteres, the “old Tabernae”, on the south side). 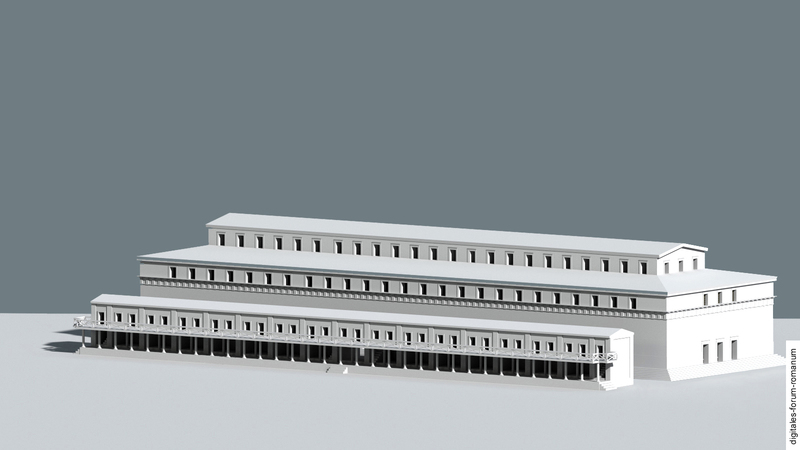 Even when the big basilicas had been built along the sides of the Forum in the course of the 2nd century B.C. 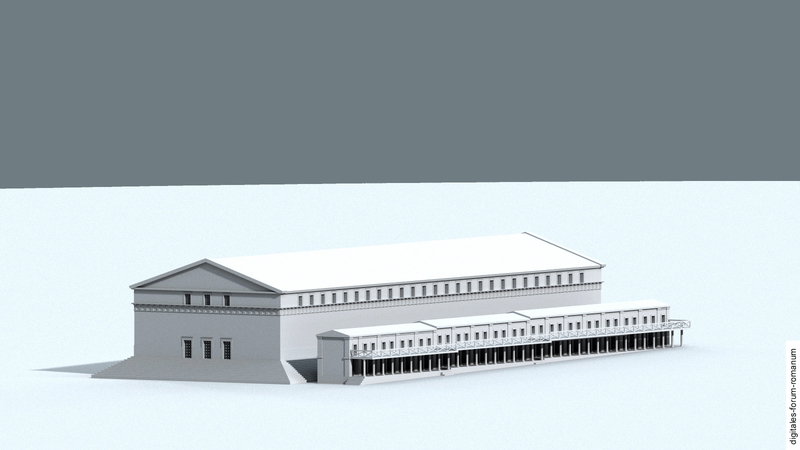 (see Basilica Fulvia, Basilica Sempronia), the comparatively small tabernae remained standing in front of them. 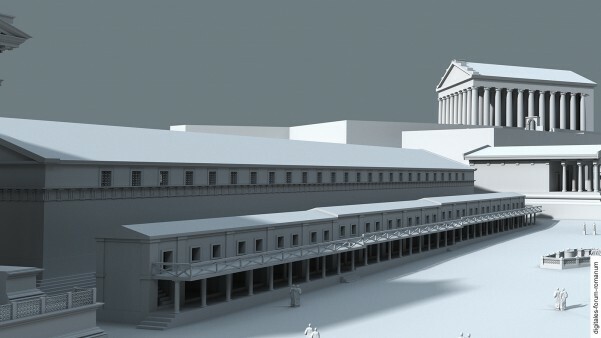 However, the innovation embodied by the monumental architecture of the basilica eventually sealed the fate of the tabernae: When these basilicas, especially the Basilica Paulli on the north side and the Basilica Julia on the south side, were rebuilt in the 1st century B.C. as prestigious structures of even greater splendour, they “swallowed up” the simplistic Tabernae, which had stood in a strong contrast to the impressive appearance of the increasingly monumentalised Forum. 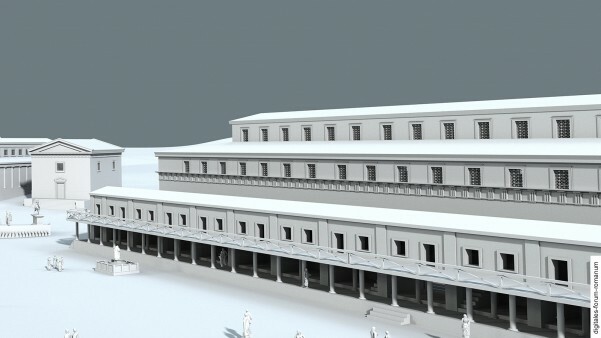 The tabernae, as the borders of the square, were replaced by the façade of the basilicas, which had already taken over the function of the tabernae as a place where the money changers could conduct their business. The sources provide different names for the tabernae, which can be attributed to their diverse history. The shops of the butchers (lat. lanius) were called “tabernae lanienae” and (since the late 4th century B.C.) the spaces for the money changers (lat. argentarius) were called “tabernae argentarii”. Both names designate different tabernae, located on opposite sides of the Forum. When the fire in 210 B.C. destroyed the tabernae argentarii on the north side and they had to be rebuilt, the new tabernae were named “tabernae novae” accordingly; the tabernae on the south side, which had not neem rebuilt, were then called “tabernae veteres” (the old tabernae). From 318 B.C. onwards the observation platforms built on top of the tabernae were called “Maeniana”, after their benefactor. Because no archaeological remains of tabernae from the Republican Forum have been discovered, our reconstruction is a merely hypothetical model. It is plausible to assume that it consisted of a simple portico with shops on the rear side. These shops could have had very different lengths –it is also conceivable that at certain intervals passageways led to the residential houses and later basilicas located behind the tabernae. In light of the sloping terrain, especially on the south side, it is possible that the tabernae veteres were constructed on several ascending terraces, perhaps in combination with an increase in the height of the roof construction at certain intervals. 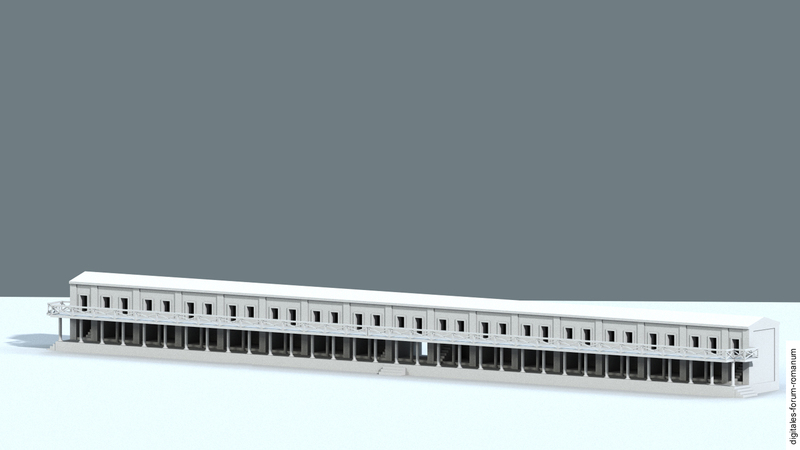 Similarly hypothetical is our reconstruction of the Maeniana on top of the tabernae. 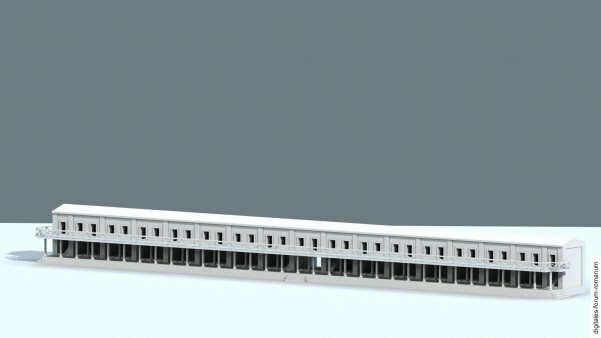 In our model we have reconstructed them as balconies with adjoining roofed rooms at the back. 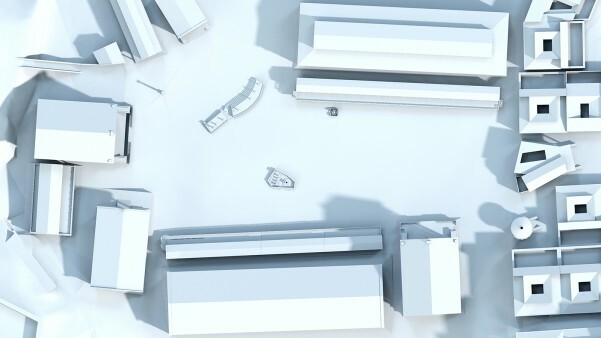 (We have assumed the latter on the basis of structural considerations: Postulating such rooms makes sense in order to provide the horizontal beams of the platform area, on which the spectators stood at the front, with an appropriate counterweight). F. Coarelli, Foro Romano I. Periodo arcaico (Rome 1983) 140-155. F. Coarelli, Foro Romano II. Periodo repubblicano e augusteo (Rome 1985) 201-208. E. Papi, Tabernae Argentariae, in: E.M. Steinby (ed. ), Lexicon Topographicum Urbis Romae V (Rome 1999) 10-12. E. Papi, Tabernae circa Forum, in: E.M. Steinby (ed. ), Lexicon Topographicum Urbis Romae V (Rome 1999) 12–13. E. Papi, Tabernae Lanianae, in: E.M. Steinby (ed. ), Lexicon Topographicum Urbis Romae V (Rome 1999) 13-14. E. Papi, Tabernae Novae, in: E.M. Steinby (ed. ), Lexicon Topographicum Urbis Romae V (Rome 1999) 14-15. E. Papi, Tabernae Veteres, in: E.M. Steinby (ed. ), Lexicon Topographicum Urbis Romae V (Rome 1999) 15.